This is a primer for labeling and properly uploading mixtapes. Some tech-savvy dudes will mock my simple suggestions. But it’s hard to laugh at the sundry ways musicians, labels and marketers label their wares; and the inconvenience they cause for those of us who actually try to maintain order on our hard drives. Sometimes the easiest path is the least followed. 1. Include the name and the title in the folder label. You’d be surprised how many downloads never include this very important information. 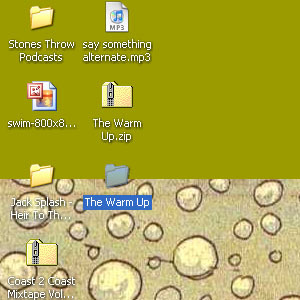 I download dozens of MP3 albums a week; when a mixtape folder doesn’t have proper labeling, it sits on my desktop like a mystery. I often have to toggle back to my desktop, open the folder and highlight an MP3 file so I can figure out the artist and the title. It’s a big hassle, and doesn’t exactly make me keen to listen to the music. In fact, I often just delete it. It’s easy to add a proper label to a folder. Just highlight the folder and type in the name and the title. 2. Don’t use weird punctuation in labels (!, ?, et cetera). Zip programs may act unexpectedly once encountering them — they may unzip the folder, refuse to unzip the folder and claim that it is “corrupted,” or throw a fit and leave the corrupted folder on your desktop forever (or at least until you do a clean install of your computer). Even if your name or album title has a “?” in it, it’s better to just label your folder using underscores (“_”) and periods (“.”). 3. 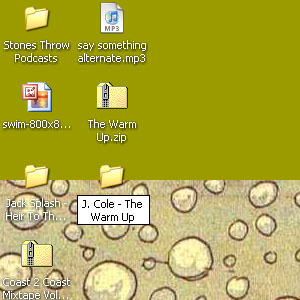 Include all album artwork images in the mixtape folder. 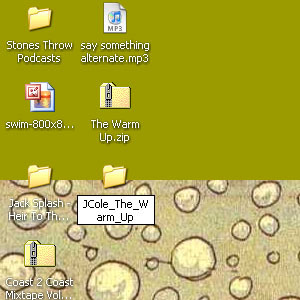 A few days ago, I downloaded Jack Splash’s new mixtape Heir to the Throne Vol. 1 from the SmokingSection.com. When I unzipped the folder, however, it didn’t include the album artwork .jpgs, even though the artwork is clearly displayed on the website. Fail. With the recent push towards replicating the tactile experience of possessing an actual record or CD, it seems that rappers (and yes, fantastic soul dynamos like Mr. Splash) would want to lead the charge and include the album artwork .jpgs in their mixtape downloads. And hey, maybe you could even include some publicity photo .jpgs for bloggers who want to re-post your tape, too. After all, it seems like bloggers (and aspiring bloggers) mostly download these things, anyway. 5. Stick to the .mp3 audio format. Getting a folder of .wav and .m4a files (or even, god forbid, .mp4, .aiff, .wma, et cetera) is like getting a pair of socks in my Christmas stocking. Sure, they’re useful, but do I really want them? If you’re going to go artsy-fartsy and use .flac, then have the courtesy to announce it so people can decide whether they want to dilly-dally with them. 6. 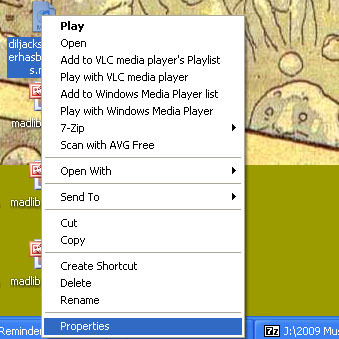 Label your .mp3 files properly. 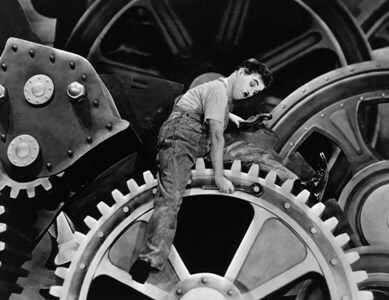 This may be tricky for some technically-challenged artists, so I’ll break it down for you. a. Right-click on .mp3 file. c. Click on Summary. Here you can enter formatting information like Artist, Album Title, Year, Track Number and Genre. I understand this might be too much of a hassle. For a quicker solution, format your files by loading them in iTunes first; or use Exact Audio Copy, a CD-ripping program that also formats files. 7. Rip files at a consistent bit rate. Ripping files at different rates (192 kbps, 256 kbps, et cetera) can make for significant dips in sound quality. As a result, one track will bang loudly through my computer speakers, while another will make me turn up the volume, straining to hear the music. At the very least, sticking to one rate (preferably 320 kpbs) will keep your listeners from having to constantly fiddle with the volume knob. 8. Use a file-hosting site that isn’t clogged with spam and pop-up links. This can be tricky, as popular sites like Zshare.net and Mediafire.com flirt with different levels of pop-ups, depending on how desperate they are for advertising cash. All I know is that when I’m inundated with pop-ups, I fear that my computer is about to be attacked and I cancel the download. 9. Use a file-hosting site that doesn’t set a download limit. Many sites such as YouSendIt.com cap the number of downloads unless you purchase an account with them. Others such as Rapidshare.com use a “queue” system that makes you wait 60 seconds or more, which prevents them from being overloaded with traffic. I’d much rather wait a minute than click on a link that’s “dead” because too many users already downloaded the folder. 10. If you’re going to require that I give you my email address first to access the mixtape, then don’t abuse it. Don’t sell my email address to a third-party business, and don’t assault me every few days with asinine “updates” about some cafe you’re DJ’ing at in Manhattan. Most importantly, emphasize quality over quantity. Stop trying to be Lil Wayne and spend some time on your craft. Then maybe I’ll spend some money on your official album, too. This entry was posted in News, Superlists and tagged computer love, digital divide. Bookmark the permalink.